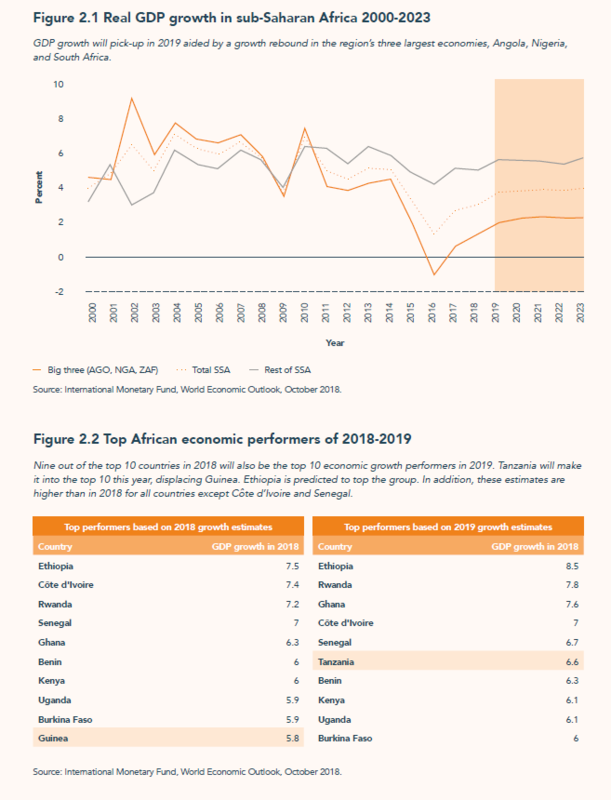 In 2019, the economic outlook of sub-Saharan Africa will strengthen, due largely to a combination of higher commodity prices, a stronger global economy, and supportive domestic policies. The latest projections have the region’s aggregate gross domestic product (GDP) growth stepping up to 3.8 percent this year, up significantly from the 2.6 percent average growth rate of the past four years.1 Thereafter, growth will rise to just over 4 percent by 2023. The aggregate contour masks significant differences across countries. Importantly, despite notable improvements, economic growth remains weak in Angola, Nigeria, and South Africa, the continent’s largest economies,2 with growth averaging under 2.5 percent—which is comparable to the rate of population growth—over the next five years. These large economies remain at risk of a lost decade (flat per capita GDP) unless policymakers implement significant reforms to reduce dependence on oil in Angola and Nigeria and, in the case of South Africa, to overcome structural problems—many inherited from the apartheid era. In this regard, priorities of President Cyril Ramaphosa and Vice President Yemi Osinbajo suggest strategies that are encouraging. Excluding these large economies or focusing on the country-level growth rates reveals an even brighter outlook for the region. Aggregate growth for the region rises to 5.7 percent in 2019 and remains at around this rate through 2023 (Figure 2.1). About half of the world’s fastest-growing economies will be located on the continent, with 20 economies expanding at an average rate of 5 percent or higher over the next five years, faster than the 3.6 percent rate for the global economy. Ethiopia, Rwanda, Ghana, Côte d’Ivoire, Senegal, Benin, Kenya, Uganda, and Burkina Faso continue to be among the top-10 performers this year, and Tanzania moves up into the top 10, displacing Guinea. The debate around the sustainability of Africa’s debt lays bare the fact that the challenge of sustainable financing for Africa’s development has not yet been fundamentally addressed. The relatively bright economic prospects in several countries face important downside risks both external and domestic. Among the external risks are the possibilities of market stepdown in global growth or an escalation in trade protectionism, which could result in a drop in commodity prices and in demand for Africa’s exports and push up borrowing costs. Key among the domestic risks is the rising level of government debt and concerns about debt sustainability in several countries. A top priority for policymakers in 2019 is to ensure that their debt management frameworks and strategies are updated to the new structures of the debt, and to take bold steps to strengthen governance around tax revenue collection. Government debt, which has been an important source of financing, along with debt servicing cost has risen rapidly in recent years. As a result, at least 14 countries—one-third of all countries in the region—are judged to be either in debt distress or at high risk of debt distress, up from only six countries in 2013. Total debt and external debt for these countries is estimated at $160 billion and $90 billion, respectively. This observation has raised concerns that the region might be on course for another broad-based debt distress situation reminiscent to that which led to the Heavily Indebted Poor Countries Initiative (HIPC) and the Multilateral Debt Relief Initiative (MDRI). 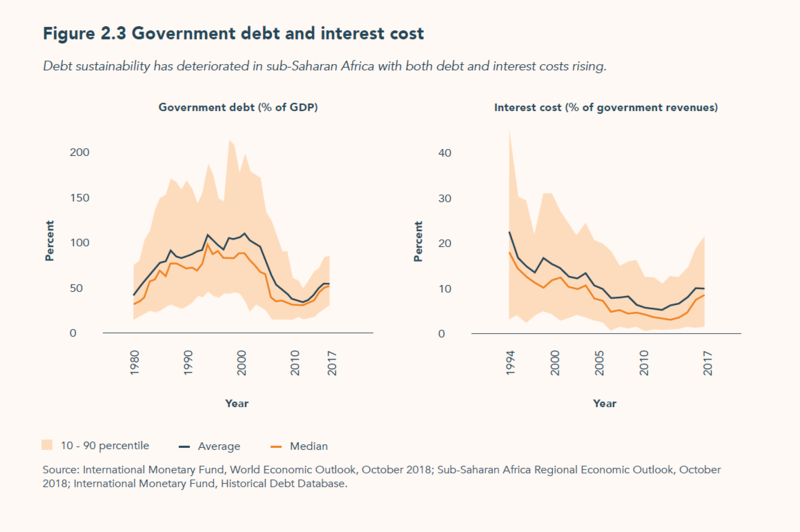 Following the implementation of HIPC/MDRI, the average public debt as a percent of GDP for all sub-Saharan countries receiving relief fell from 110 percent in 2001 to 35 percent in 2012, and the interestrevenue ratio fell from 13 percent to 5 percent. Since 2013, both indicators of debt sustainability have deteriorated significantly. The average debt ratio has risen to an estimated 57 percent in 2017, particularly in Cabo Verde, Eritrea, Republic of Congo, and Mozambique where it exceeds 100 percent of GDP. Similarly, the average interest-torevenues ratio increased from 5 percent in 2012 to an estimated 10 percent. The interest cost exceeds 20 percent of revenues in Burundi, Gambia, Ghana, Nigeria, and Zambia. 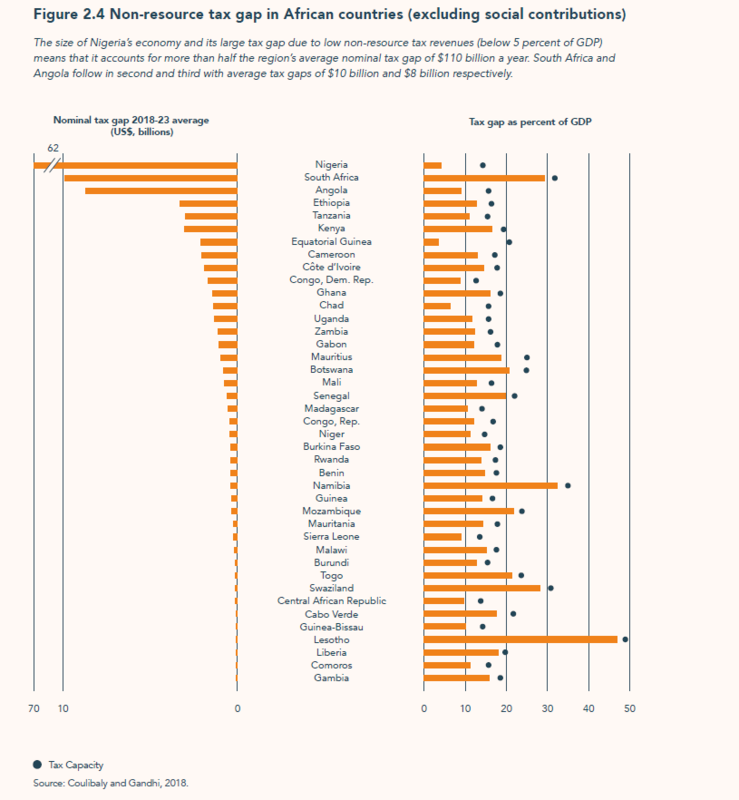 Compared with the pre-HIPC/MDRI period, debt levels are still generally lower, but interest payments as a share of government revenues are close for several countries. This contrast points to the poorer quality of the debt in the recent debt buildup. External debt remains predominant, as in pre-HIPC/MDRI build up, accounting for 57 percent of total debt in 2017. However, the share of commercial—and more costly—debt has increased. The share of private debt has risen from 9 percent of external debt in 2000 to 17 percent in 2017, owing partly to the issuances of eurobonds by several countries since 2006. Meanwhile, the share of multilateral and bilateral debt has declined. Another important development in the structure of debt is the more diffuse creditor base. In addition to the growing importance of private lenders, the number of official creditors has also increased. Among bilateral lenders, the share of Paris Club members has fallen from over 40 percent in 2008 to below 23 percent in 2017, while that of non- Paris club members—notably Chinese lending—has increased significantly. Finally, some countries have also issued commodity-linked debt. These changes in the structure of debt require that governments and their development partners adapt their debt management approaches and frameworks to reflect the new environment, including ensuring that the debts are sufficiently hedged against global market risks. A strategy for the near term that can help countries balance the need for financing while controlling indebtedness is to strengthen governance around tax revenue collection. The debate around the sustainability of Africa’s debt lays bare the fact that the challenge of sustainable financing for Africa’s development has not yet been fundamentally addressed. The region continues to suffer from perennially low domestic saving rates, which are projected to average just 18 percent of GDP3 over the next five—among the lowest in the world, and significantly below the desired investment rate of close to 30 percent. The resulting 12 percentage points of GDP financing gap amounts to about $230 billion annually, and partly explains the increase in external indebtedness. Tax revenues are the most important component of domestic resources, and raising them has been at the center of many domestic reforms and regional and international initiatives.4 These efforts helped to boost revenue collection from 11 percent in the early 2000s to 15 percent recently. Even so, the region’s tax ratios are still among the lowest in the world, below that of Organization for Economic Cooperation and Development (OECD) countries (24 percent) and other emerging and developing countries. The good news is that there is scope to raise tax revenues above current levels by further strengthening tax capacity and improving governance in revenue collection. Strengthening tax capacity should remain a medium- to long-term policy objective, given that capacity is largely determined by entrenched structural factors such as the stage of economic development, the size of the informal sector, and the sectoral composition of economic activity, among others. Improving governance, on the other hand, can yield near-term results and help close the gap—4 percentage points of GDP—between current tax revenues and tax capacity. Significant heterogeneity in tax gaps exists across the region. At the country level, the gaps are largest for Equatorial Guinea, Nigeria, Chad (9 percentage points of GDP or higher) and smallest for Liberia, Mozambique, and Togo (2 percentage points or less). 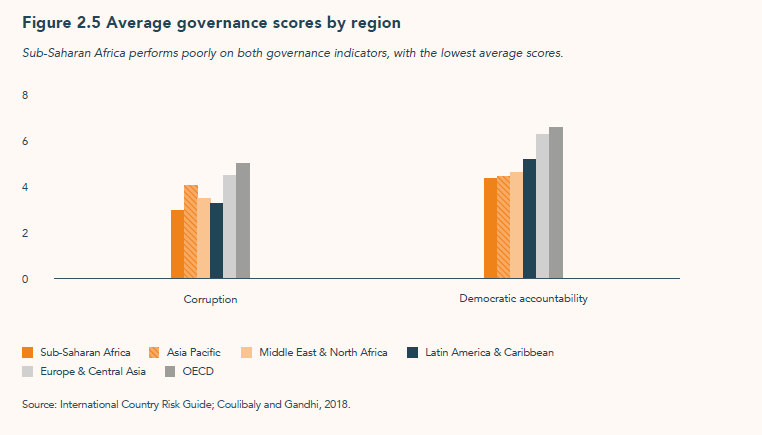 Governance indicators for the region, including corruption and accountability, remain the worst in the world. Although the debt situation is not yet at the pre-HIPC/MDRI level overall, the pace of increase along with some fundamental changes in the structure of the debt, notably the higher share of commercial debt, is concerning. Although the debt situation is not yet at the pre-HIPC/MDRI level overall, the pace of increase along with some fundamental changes in the structure of the debt, notably the higher share of commercial debt, is concerning. The relatively short tenures of commercial debts and their higher interest rates make them ill adapted to finance long-term economic development projects, particularly infrastructure. The access of African countries to global financial markets is a welcome and inevitable phase in economic development. Along with access to global financial markets comes increased scrutiny of the fundamentals of the local economies and of domestic policies, which, in turn, imposes more discipline and accountability on policymakers. Finally, the wider range of creditors allows for a more diversified creditor base and likely attests to greater confidence in the region’s economic prospects. However, these new features of the debt come also with new challenges. Importantly, debt management frameworks and approaches need to be adapted to the new structures of the debt and global market risks. In addition, the more diffuse creditor base makes eventual debt resolutions more complex. International financial institutions can help by revisiting rules on access to concessional funding, and by laying the groundwork for a uniform and orderly debt resolution mechanism that reflects the new environment. The debate around debt sustainability is a reminder that the challenge of sustainable financing for Africa’s development remains a work in progress. Strengthening governance around tax collection offers a near-term solution to mobilize additional resources to finance the development agenda and slow indebtedness. Moreover, where appropriate, governments should resort more to innovative financing mechanisms such as blended finance or public-private partnerships and other risk mitigation mechanisms to crowd in more private sector investment and help preserve the solvency of public sector balance sheets. Taking these steps will sustain economic progress throughout 2019 and beyond. International Monetary Fund, World Economic Outlook, October 2018. Angola, Nigeria, and South Africa make up 55 percent of the region’s aggregate GDP estimated at market exchange rates. Based on projections in the October 2018 edition of the World Economic Outlook database. Some of these initiatives include the 2002 Monterrey Consensus, the 2011 Busan Agreement, the Addis Tax Initiative launched in 2015, and the Platform for Collaboration on Tax launched in 2016. Coulibaly, Brahima and Dhruv Gandhi. 2018. “Mobilization of tax revenues in Africa: State of play and policy options.” Brookings Institution. Barone, Guglielmo and Sauro Mocetti. 2011. “Tax morale and public spending inefficiency.” International Tax and Public Finance. Vol 18, Issue 6.